Easy No Bake Fall Snack Mix Recipe - Just 4 Ingredients! Fall snack mix is the perfect no-bake treat for those nights where your family wants something sweet, but you don’t want to spend hours in the kitchen. 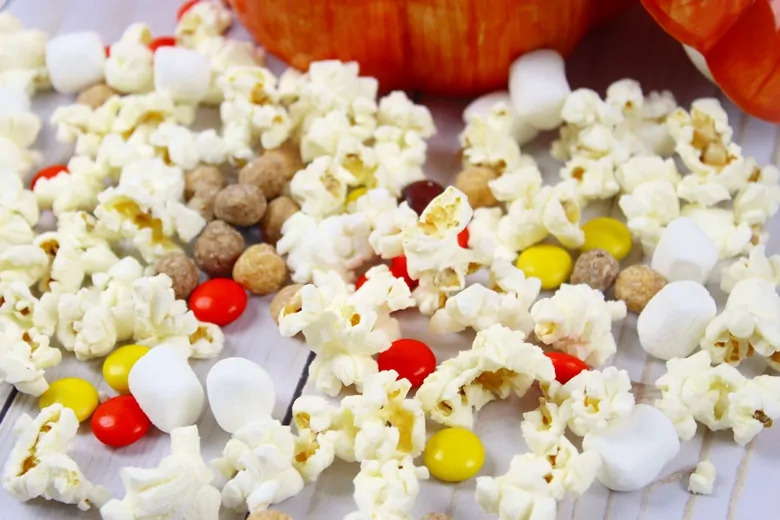 Plus, this easy snack mix is a great treat to serve at Halloween parties, Fall festivals, or as a dessert after Thanksgiving dinner with a cup of apple cider. Fall may be the unofficial kickoff of baking season, but sometimes you don’t even have to turn on the oven to make an amazing treat. This easy Fall snack mix is a sweet and salty treat that you are going to love to make for your family. It literally takes minutes to throw this easy snack mix together, so it is a great treat to make when you need something last minute. Alternatively, if you like to plan ahead, this snack mix will store perfectly in an airtight container, which means you can make it ahead of time. This easy Fall snack mix recipes proves that great recipes don’t have to be complicated or time consuming. This easy snack mix recipe would be perfect for the kids to make on their own, or with a bit of help. Having the kids join you in the kitchen is not only fun, but it is educational as well. Cooking is an important life skill, and practicing kitchen skills such as following recipes and measuring ingredients can help the kids develop these skills. For more kid-friendly recipes, check out these kid-friendly recipe ideas. Making this Fall snack mix is seriously as simply as adding all of the ingredients to a bowl and then mixing them together. It doesn't get any easier than that. You can also play around with the ingredients to truly make it your own. For example, if you prefer to make the recipe without peanut butter, just add fall colored chocolate candies and a cereal such as Cocoa Puffs. Not a fan of kettle corn? Use caramel corn instead. Switch it up however you would like. Another thing I love about this snack mix is that you can easily double the recipe, triple the recipe, or make as big of a batch as you need. 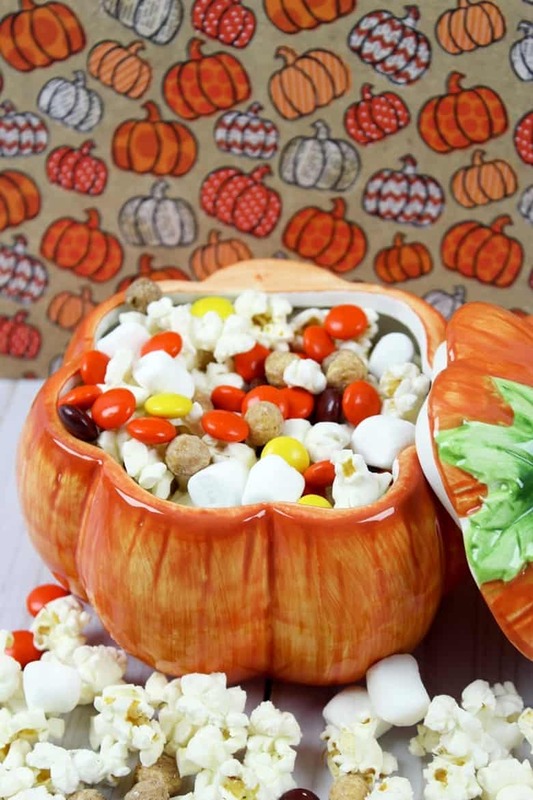 This makes this Fall snack mix great for feeding a crowd, or for bringing to parties. 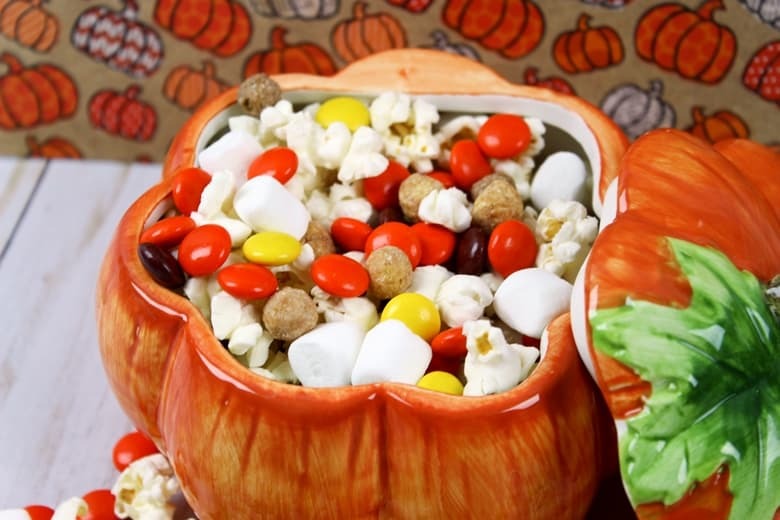 If you are serving your Fall snack mix at a party, consider serving it in something fun and festive like a pumpkin or Halloween cauldron. It would even make a great Halloween party favor. Just divide the snack mix into cute treat bags for people to take with them as they leave the party. However you enjoy this snack mix, one thing is for certain — you will love it. It's everything that a great snack should be: easy, quick, and delicious! Fall snack mix is the perfect no-bake treat for those nights where your family wants something sweet, but you don’t want to spend hours in the kitchen. Plus, it is a great snack to serve at parties! Add all ingredients to a large mixing bowl and gently toss until well mixed. Transfer to your serving bowl and enjoy! Store snack mix in an airtight container. This would be great for a party, no cooking! Will definitely give this a try. Where did you get the cookie jar, if you can share that. It’s gorgeous. Hi Betty! Thanks for your comment 🙂 This pumpkin jar was a thrift store find but Michael’s has a similar one I think! I love how easy and fun this is! 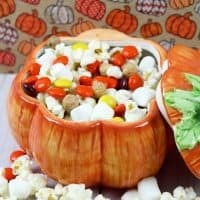 It would make a great snack for a fall party too! I’ll have to give this a try! My kids would love it! 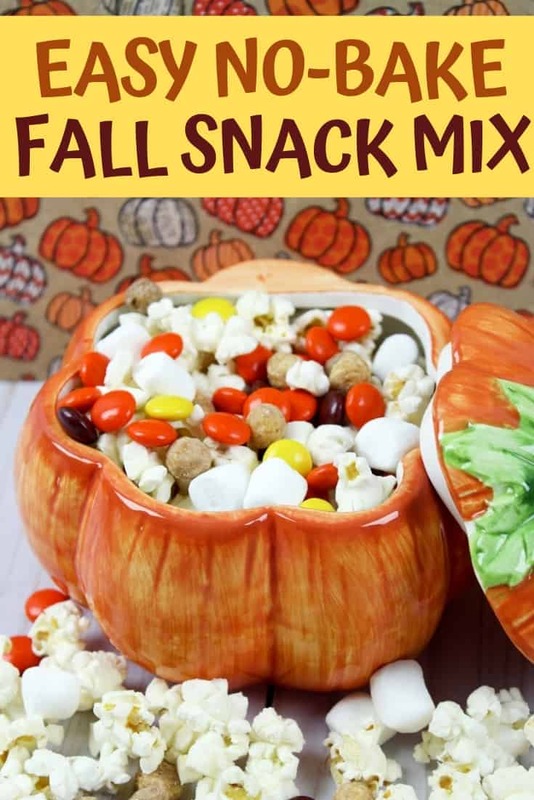 The snack is nice, but I really love that pumpkin container. Thanks for posting!